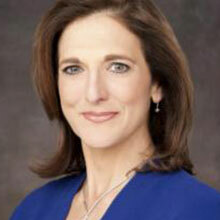 Jill Schlesinger, CFP®, is the Emmy-nominated business analyst for CBS News. Jill appears on CBS radio and television stations nationwide covering the economy, markets, investing and anything else with a dollar sign. She translates complicated business and economic news into understandable, relatable topics for everyday viewers and listeners. She is a weekly guest on NPR’s “Here and Now,” appears on American Public Media’s “Marketplace Weekend” and is a contributor to Money Magazine. Jill also serves as the Senior CFP Board Ambassador for the Certified Financial Planner Board of Standards, Inc., where she provides timely personal financial advice, explains how current economic and financial news impacts consumers’ lives, encourages people to use the services of CFP® professionals and explains the importance of having a financial plan. Jill helps support CFP Board’s Public Awareness Campaign, including contributing blog posts and videos to CFP Board’s consumer site, LetsMakeaPlan.org. Jill is also the host of the “Better Off” podcast and of the nationally syndicated radio show, “Jill on Money,,” which airs in over 95 markets. Jill also writes the nationally syndicated column “Jill on Money” for Tribune Media Services and was named one of the Top 10 LinkedIn Influencers of 2015 and Top 10 LinkedIn Voices of 2016.